HarperCollins Canada, Limited, 2014. Mass Market Paperback. Very Good. Disclaimer:A copy that has been read, but remains in excellent condition. Pages are intact and are not marred by notes or highlighting, but may contain a neat previous owner name. The spine remains undamaged. At ThriftBooks, our motto is: Read More, Spend Less.Dust jacket quality is not guaranteed. Harper. MASS MARKET PAPERBACK. 0062275526 Brand New! Not Overstocks or Low Quality Book Club Editions! Direct From the Publisher! We're not a giant, faceless warehouse organization! We're a small town bookstore that loves books and loves it's customers! Buy from us and you get great service as well as a great price! Your business is valued and your satisfaction is guaranteed! . New. Harper. MASS MARKET PAPERBACK. 0062275526 Remainder mark . Fine. Harper. MASS MARKET PAPERBACK. 0062275526 . New. Harper. MASS MARKET PAPERBACK. 0062275526 *LIKE NEW* Ships Same Day or Next! . Fine. Harper. MASS MARKET PAPERBACK. 0062275526 *BRAND NEW* Ships Same Day or Next! . New. Harper, January 2014. Mass Market Paperback. New. All of our books are in clean, readable condition (unless noted otherwise). We do not accept books with water damage, strong smoke smell, or just plain beat up. Our books generally have a store sticker on the inside cover with our in store pricing. If the edges are starting to get wore, but the book is otherwise in good condition, we may tape reinforced the edges. HarperCollins. Reissue. Literature & Fiction. New. 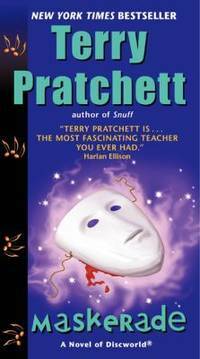 Discworld Brand New: This item is brand new unopened, never used and still in its original manufacturer condition. Harper. MASS MARKET PAPERBACK. 0062275526 Special order direct from the distributor . New. HARPER. New. 7.54 x 5.44 cm. 2014-01-28. Good. Ships with Tracking Number! INTERNATIONAL WORLDWIDE Shipping available. May not contain Access Codes or Supplements. May be ex-library. Shipping & Handling by region. Buy with confidence, excellent customer service!